The Canadian-made Bodyguard T240 treadmill is a classy piece of equipment, full of awesome awesomeness. The company is best known for their commercial fitness machines but they are also making a successful run at establishing their own niche in the residential market. The display features many customizable menu settings in English, Spanish and French, as well as allowing the user to enter his/her height and weight, etc., in the profile window. 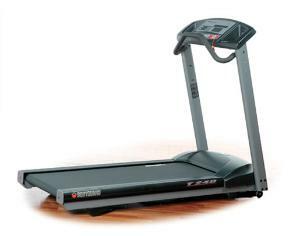 UPDATE: The T240 is no longer available, as there is a whole new lineup of Bodyguard treadmills. The current catalog includes the T-30, T-45 and T-75 models. All of the newer machines are more advanced than the T240, but its closest match would definitely be the entry level T-30. That one ups the ante to a 3 HP motor, 12 mph speed, a 400 lb. max user weight capacity, wireless heart rate monitoring and a longer runnibg belt. The T-45 and T-75 are even more advanced, but they are a bit pricier. So any of the newer models will be a nice step up for you, if you decide to stay with a Bodyguard treadmill. The Bodyguard T240 has won many Best Buy awards from experts in the field. They especially like the Sorbothane® deck technology and Bodyguard® Dissipation System (BDS) which absorbs shock levels up to 95% and prevents the running deck from rebounding excessively underneath you as you run. In addition, the outstanding engineering on Bodyguard treadmills has been proven in the past as these units just don’t have many calls for repairs. Owners, especially runners, are pleased with their purchase of the T240. If you prefer the old styling of handlebars you can choose those as an option; otherwise, the crossbar is standard, but still quite comfortable. Treadmill reviewers seldom report complaints about Bodyguard’s equipment since they are considered among the best in the industry. At $2095 (MSRP: $2499), the Bodyguard T240 is a well-designed treadmill. The company has been the recipient of numerous Best Buy rewards since 1995 for many of their models, and this unit is another strong contender. It rates well in terms of overall quality, noise level, power, performance, and durability. 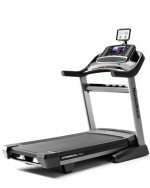 With the Bodyguard brand name on the frame, and backed by an excellent warranty and great customer service, the Bodyguard T240 treadmill is a solid machine at this price. Editor's Note: As the T240 is no longer around, check out the T-30 model, and if your budget is more open, look at the T-45 and T-75 as well.